Debris flow in Jiangjiaguo, Yunnan province, China. The San Gabriel Mountains, in Northeast Los Angeles, in their state of tectonic youth, are rising as rapidly as any range on Earth. They are disintegrating at a rate that is also the fastest in the world. Debris flows consist of water mixed with a good deal of solid material, most of which is above sand size (some of it Chevrolet size). Strung along the San Gabriel front are at least 120 bowl-shaped excavations that resemble football stadiums and are often as large. They are the debris basins. They are quarries, in a sense, but exceedingly bizarre quarries, in that the rock is meant to come to them. The debris basins vary greatly in size, not, of course, in relation to the populations they defend but in relation to the watersheds and washes above them in the mountains. Capacities are mostly under 100,000 cubic yards. Debris flows do not occur in every possible season and in every watershed. The places change and the volumes differ. The vintage years were 1934, 1938, 1969, and 1978. Exceptional flows have occurred at least once every 10 years. 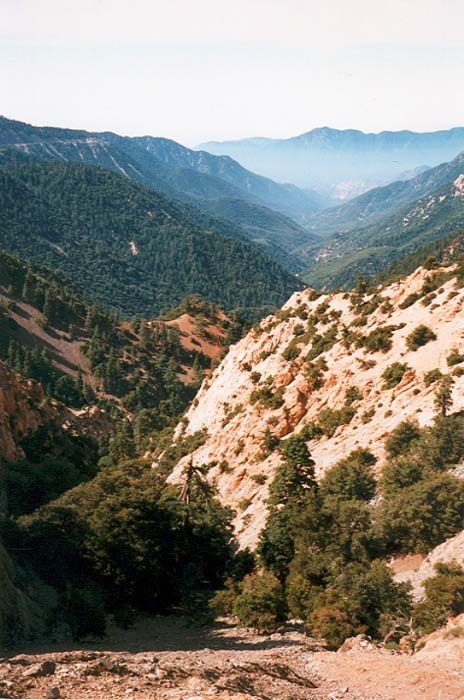 The San Gabriels are so steep and so extensively dissected by streams that some watersheds are smaller than 100 acres. The terrain slopes average 60 to 70%; in numerous places they are vertical. Many San Gabriel slopes are at the angle of repose or beyond it. The vegetation of the region is called chaparral. All chaparral has in common an always developing, relentlessly intensifying, vital necessity to burst into flame. Fire nourishes and rejuvenates the plants. There are basal buds that sprout only after fire. Droughts are so long, rains so brief, that dead bits of wood and leaves scarcely decay. When chaparral has not been burned for 30 years, about half of the biomass will be dry dead stuff. The leaves of chaparral are glossy with oils and resins that seal in moisture during hot periods and serve the dual purpose of responding explosively to flame. The fire wind is the Santa Ana, which brings instant critical fire weather. Humidity drops very close to zero. Chaparral is one of the most flammable vegetation complexes there are. It burns as if it were soaked with gasoline. Before Los Angeles was settled, chaparral burned every 30 years or so. During a fire, the soil below the chaparral experiences a chemical change, and a little below its surface becomes waterproof. Chaparral litter gives the soil a "waxlike complex of long-chain aliphatic hydrocarbons." During a fire, the temperature at the surface is about 600 to 700 oC. However, the soil is an effective insulator, and the temperature 1 cm below the surface may be less than 100 oC. The waxlike substances vaporize at the surface and recondense in the cooler temperatures below. The hydrophobic soil layer is 1-6 cm down the surface. Above that layer, the veneer of burned soil is wettable. The waterproof soil is the major factor in the occurrence of debris flows. Los Angeles is doing well if it gets 15 inches of rain one year: an arid climate. The heaviest downpours always occur on watersheds most recently burned. This may be due to ash particles promoting coalescence. The older chaparral becomes, the hotter it burns. In the first 10 years, it is nearly incombustible. It burns usually before it is 40 years old. The ultimate origin of the debris flows is the continuous tectonic front (within the San Andreas fault) which has made the San Gabriel Mountains one of the steepest mountain fronts in North America. The kink in the San Andreas Fault runs along the inland base of the San Gabriel Mountains. The San Gabriel Mountains are being compressed about 1/10 of an inch every year. After a truly exceptional fire followed by the most exceptional flood, a large basin is required to hold the debris. Sizing of debris basins is based on hydrology. Designs are focused on the 10-yr, 25-yr, 100-yr flood. These terms are based on data for 100 years and represent educated guesses. Developers will buy a piece of property without thinking that it is at the mouth of the drainage. The engineers should be cognizant of it, but they are not. In a productive season, the debris basins will catch more than 1 million cubic yards. Cleanout costs can exceed $60 million in one year. 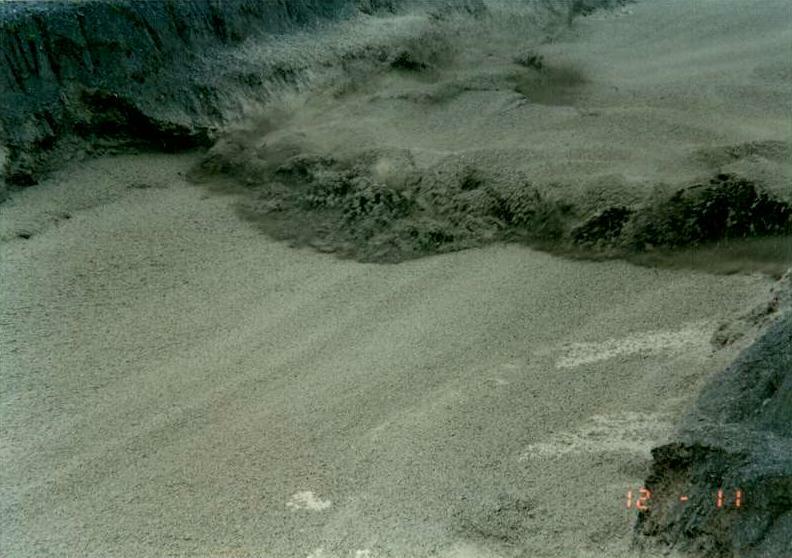 To date (1989), the debris basins have trapped 20 million tons of mountain. In 1978, 18 basins filled. Someone was inspired to put the rock back up in the mountains. This provides job security for the engineers. 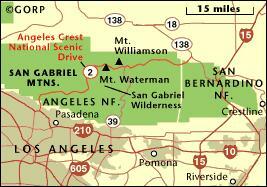 Proximity to San Andreas Fault produces high rates of tectonism along the San Gabriel Mountains east of Los Angeles. The geographic location (latitude 34o North) and western exposure to ocean winds produce a mediterranean ecosystem, with drought-resistant chaparral vegetation, which burns periodically (every 30 years). The location (Southern California) is periodically subjected to strong winds referred to as Santa Ana. These winds can cause the vegetation to ignite, developing the wildland fires, which are common during strong-wind events. Fire causes the waxy compounds stored in the litter to vaporize at the surface, and recondense at a distance of 1-5 cm below the surface, creating a hydrophobic soil layer. Intense precipitation, greater than 1 cm/hr, usually follows the burning of chaparral, presumably because of ash particles promoting coalescence and precipitation. Thus, tectonism, chaparral vegetation, strong wind, fire, and intense precipitation contribute to mobilize the soil above the hydrophobic layer to create a debris flow.